State power is essential to the fair administration of grievances. An immensely powerful permanent enforcement agency—i.e., the state—now exists. State power is not always exercised fairly, however. The book’s remaining chapters analyze justice deficits in the administration of criminal law. 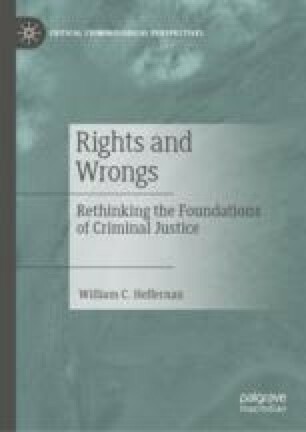 This chapter focuses on decriminalization of drug offenses. It proposes a presumption in favor of this: if someone engages in conduct that doesn’t harm another person, it is wrong, the presumption holds, for the state to use its power to punish that person for the conduct. The presumption is rebuttable in certain settings. For example, it permits the state to use its power to prevent adolescents from gaining access to drugs. It also may use its power to enforce a regulatory scheme that oversees access to a controlled substance. It may not, however, use its power to punish a mentally competent adult for possessing or ingesting substances harmful to his/her health. To do so is to violate the eligibility-for-punishment—i.e., the principle that limits punishment to acts that either aim at inflicting or actually inflict harm on others.